the Aspirus Health Foundation or given back to others. Hear from those who have supported the Aspirus Health Foundation or given back to others. The Aspirus Health Foundation exists to strengthen the healing mission of Aspirus and to improve health and quality of life for people in our communities. Consider making a gift to the Aspirus Health Foundation and support important initiatives aimed at improving health and quality of life for patients and families at Aspirus and people in our community. The mission of the Aspirus Health Foundation is to develop critical resources necessary to advance the health of our communities and increase health services in the region. 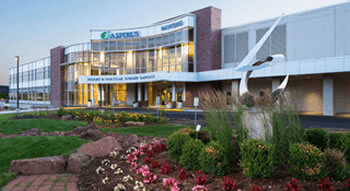 The vision of the Aspirus Health Foundation is to be the leader in developing community partnerships to advance the health of people in north central Wisconsin. The Aspirus Health Foundation Board of Directors is proud to oversee the work of the Foundation and to ensure that the donations and support entrusted to us are used for the purposes for which they were given. Thank you for partnering with us to advance health, increase health services, and care for people in our region. 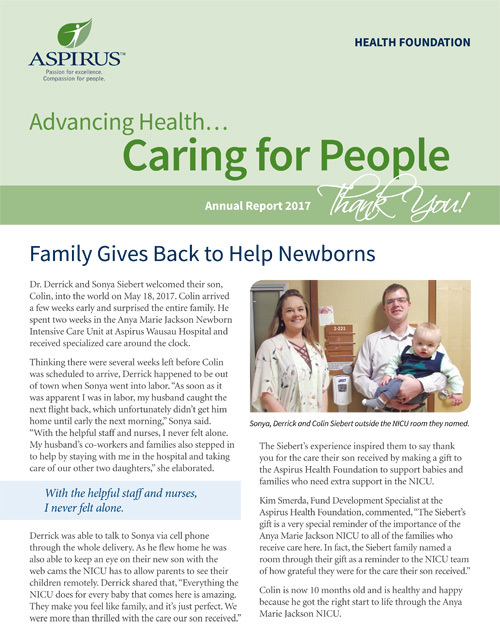 Check out the latest edition of Aspirus Health Foundation's newsletter.